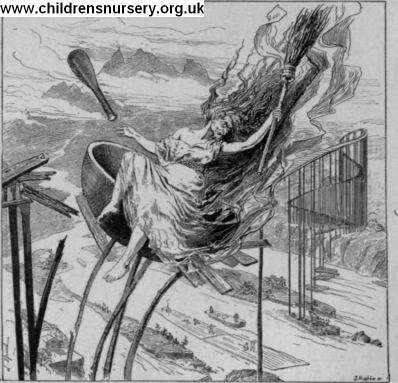 in her iron mortar, urging it on with the pestle, sweeping away her traces with the broom. She dashed up to the fiery river, gave a glance, and said, ' A capital bridge !' She drove on to the bridge, but had only got half-way when the bridge broke in two, and the Baba Yaga went flop into the river. There truly did she meet with a cruel death! it flies just like a bird.' So they got on its back and rode away.